Legend has it that after Margarita Sanson, mother to St. Pius X, kissed her newly-installed son’s papal ring, she then gently prompted the new pope to kiss her own wedding ring, because the commitment behind it had helped him rise to the papacy. It’s an extreme example of the critical roles played by mothers in religious vocations. Stephanie Rubeling of Frederick, who has two sons pursuing the priesthood, is a contemporary, local example. Michael Rubeling, 26, will be ordained a transitional deacon at the end of May, and, “God-willing,” his mother said, will be ordained to the priesthood next year. Peter Rubeling, 20, is in his third year studying at The Catholic University of America and St. John Paul II Seminary, both in Washington, D.C., and hopes to enter major seminary after he obtains his bachelor’s degree. 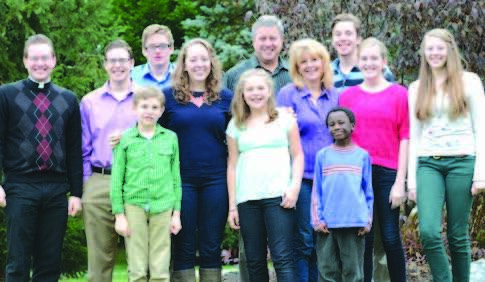 Both young men – who are two of Gary and Stephanie Rubeling’s 10 children – plan to serve as priests in the Archdiocese of Baltimore. That is not to say that she pushed the idea. In Rubeling’s family, the “just right” nourishment was eucharistic adoration. Many parents, she speculated, may not actively encourage vocations because they imagine priests to lead lonely lives. Some parents fear a lack of grandchildren, she added, acknowledging that, with 10 children of her own, it’s a fear she can’t fully comprehend. She has seen it in her own life. “That’s what we’re all called to do,” she said.